The first time we visited the UK we spent a week in London and Buckingham Palace was the first place on my list to visit, we came down Constitutional Hill and around a little bend and there it was, a place I had only seen on television and read about in books. Buckingham Palace is the place Londoners always head to in times of turmoil or celebration, whether it’s to mourn the death of their favorite Princess or to celebrate the end of a war and their Monarch, Buckingham Palace is their meeting place. I took the above photo of Buckingham Palace on our first visit to London. You can tour Buckingham Palace in August and September when the Royal Family head to Scotland for their Summer holiday, you can tour the downstairs State Rooms and there’s usually a special exhibition going on, in the past there have been exhibits of jewelry, toys, wedding gowns worn by princesses and future Queens. This year the exhibit will focus on fashion in celebration of the Queen’s 90th birthday, outfits she has worn at all different times of her life will be on display. 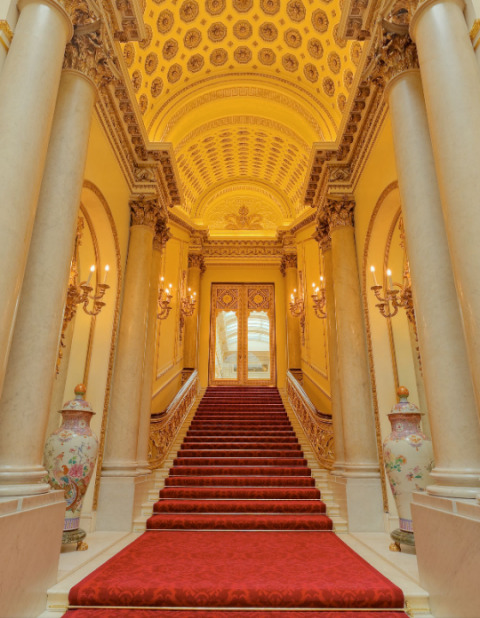 That’s it with facts on Buckingham Palace, here’s a peek behind the gates and doors at the architecture and decor of a real palace, Enjoy!!! By Tab Byrum on April 20, 2016 . What time of year were you there? This year it’s opening in late July thru August and September.